● Streptococcus mutants are the main pathogen causing dental caries. The number of this pathogen is increased in HIV patients, leading to dental infections. ● The compromised immune system also leads to increased dental infection. ● Decreased salivary gland functions leading to dry mouth also make these patients prone to dental infection. ● Bad dental hygiene can also cause dental infection in HIV patients. Taking care of dental problems can ease some of the symptoms associated with dental infection. The fear of needles, pain, and anxiety acts as a barrier to seeking dental care. Previous bad experience with the dentist can also make them avoid a dental visit. Dental procedures take a longer time, and these long waits can discourage the patient to take treatment. Commonly, patients do not visit the dentist for regular check up until there is an immediate problem. Some HIV patients face psychological issues and depression, hence neglect their oral health. They even worry about not being treated with respect and consideration. Commonly the oral health is been neglected in HIV patients. 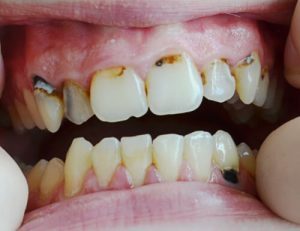 Although some studies have shown a higher risk of dental infection in HIV patients, it needs more consideration. HIV patients should be educated about the risks associated with dental infection. Dental clinics should allow patients for general checkup without hurdles. Psychological support should be provided to the patient during treatment. Although there is a potential risk associated with these dental infections they can be treated. By minimizing the barriers and providing prophylactic care for the patients these dental infections can be avoided.